Flying Heartless that cast potent spells. They are born of holy spells. They attack from long range with magic. They block physical attacks with their wings, making them difficult to defeat. Aerial Heartless that are capable of firing off a number of offensive magics. However, with low HP, these "angels" are quick to fall. 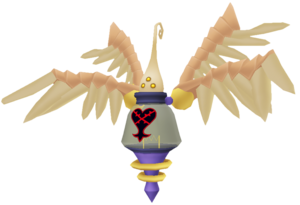 The Angel Star is an Emblem Heartless found in Kingdom Hearts and Kingdom Hearts Re:coded. Angel Stars, at first glance, appear to be fragile and weak Heartless. They get their name from their golden wings, which are formed from two larger lower wings that have two slightly smaller wings attached to the top of them; the whole assembly is kept on with two bright yellow orbs that form the joints. Their transparent glass bodies form a delicate bell shape, housing a single filament that bears a strong resemblance to the jagged jawlines of other Heartless. It rests on a tapering blue-colored stand which ends in a spike and is decorated with two pale gold rings. The top of the glass is covered with blue cap, on top of which is a tear shaped gold topper; the topper features three shining bright gold dots towards the bottom resembling eyes, and the top end of it is curled in a manner reminiscent of the hats of several other types of Heartless. The Kingdom Hearts Final Mix version features a different but equally ethereal color scheme, with the wings now in soft blues and purples, the glass body a slightly smoky color, and the end-caps now done in silver and gold. The Angel Star's name refers to its elegant, angelic wings and its ability to use light-based magic. Angel Stars shoot long-range attacks that home in on Sora's position. It is suggested that Sora defeats the Angel Stars before focusing on other enemies. Try to attack them from behind to catch them off guard, because sometimes they will hide underneath their wings and become invulnerable to attacks if attacked from the front. 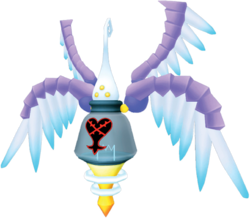 If an Angel Star is glowing, attack it immediately, as this is a sign of it performing one of three special attacks depending on the color of the glow: a pink glow will allow it to produce a strong tornado-like spell that follows Sora and can deal heavy damage. If it glows blue, it will begin charging up a ball of light that erupts into a pillar when it hits the ground and may create a new Angel Star. It is very easy to dodge, but it would be wiser to interrupt it to prevent a new Angel Star. If it glows white, it is preparing to fire three rapid-fire balls of lightning consecutively. The lightning is fast and difficult to anticipate, but can be reflected back for damage, tech points and stunning if timed correctly. Magic is not as effective against these enemies, and they absorb Thunder. Note that their ranged attack may be deflected back at them by using guard, leaving them stunned. ↑ Excluding LV Up, Trophy, Blank, and Lucky Strike chips. This page was last edited on 1 May 2018, at 18:48.